Northwestern University Press, 9780810140332, 248pp. In his 1952 book In Battle for Peace, published when W. E. B. 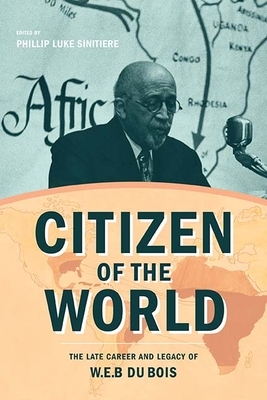 Du Bois was eighty-three years old, the brilliant black scholar announced that he was a “citizen of the world.” Citizen of the World chronicles selected chapters of Du Bois’s final three decades between the 1930s and 1960s. It maps his extraordinarily active and productive latter years to social, cultural, and political transformations across the globe. From his birth in 1868 until his death in 1963, Du Bois sought the liberation of black people in the United States and across the world through intellectual and political labor. His tireless efforts documented and demonstrated connections between freedom for African-descended people abroad and black freedom at home. In concert with growing scholarship on his twilight years, the essays in this volume assert the fundamental importance of considering Du Bois’s later decades not as a life in decline that descended into blind ideological allegiance to socialism and communism but as the life of a productive, generative intellectual who responded rationally, imaginatively, and radically to massive mid-century changes around the world, and who remained committed to freedom’s realization until his final hour.